Background and objectives Neuromuscular complications are almost universal in CKD by the time that a patient commences dialysis. Recent studies have indicated that chronic hyperkalemia may contribute to the development of neuropathy in CKD. This study was undertaken to determine whether dietary restriction of potassium intake may be a neuroprotective factor in CKD. Design, setting, participants, & measurements A 24-month prospective, single-blind, randomized, controlled trial was undertaken in 47 consecutively recruited patients with stages 3 and 4 CKD. The intervention arm (n=23) was prescribed a diet focusing on potassium restriction to meet a monthly serum potassium level of ≤4.5 mEq/L, with oral sodium polystyrene sulfonate provided if dietary advice failed to achieve the target. The control arm (n=24) received dietary advice regarding general nutrition. The primary outcome was the change in the total neuropathy score evaluated by a blinded observer. Secondary outcomes included electrolyte levels, gait speed, neurophysiologic parameters, and health-related quality of life scores. Five patients withdrew before initiation of treatment, and final analysis consisted of n=21 in each group. Results There was a greater increase in total neuropathy score from baseline to final assessment in the control arm compared with the intervention arm (6.1±6.2–8.6±7.9 controls; 7.8±7.4–8.2±7.5 intervention; change 2.8±3.3–0.4±2.2, respectively; P<0.01). The intervention significantly reduced mean serum potassium compared with controls (4.6±0.1–4.8±0.1 mEq/L mean recorded every 6 months over the trial duration; P=0.03). There were no adverse changes in other nutritional parameters. Improved gait speed was also noted in the intervention arm compared with the control arm, with a mean increase of 0.15±0.17 m/s in the intervention group versus 0.02±0.16 m/s in the control group (P=0.01). Conclusions Our results provide important preliminary evidence that dietary potassium restriction confers neuroprotection in CKD and should be confirmed in a larger multicenter trial. Patients with CKD, compared with healthy controls, are weaker, are less active, and have reduced exercise capacity (1–3). These physical limitations lead to diminished quality of life and higher mortality rates (4,5). Neuromuscular disorders, including neuropathy and myopathy, are highly prevalent in CKD and cause pain, muscle weakness, and sensory loss (6). Recent studies have shown the presence of peripheral neuropathy, also known as uremic neuropathy, in 80%–100% of patients with severe CKD (7,8). There is no treatment for neuropathy in CKD, and even renal transplantation frequently fails to provide benefit (9). For many decades, the cause of neuropathy in CKD remained unclear, but recent studies have shown correlation between peripheral nerve dysfunction and serum potassium and suggested that hyperkalemia may be the causative mechanism (8,10). These studies have also suggested that abnormalities of nerve function in CKD may occur with serum potassium concentrations in the high normal range (11). The clinical relevance of these findings, however, remains unclear, and it is unknown whether more stringent control of potassium levels in CKD has any benefits in terms of neurologic or physical function. The aim of this study was to conduct a randomized, controlled trial to assess whether dietary restriction of potassium intake may be neuroprotective in CKD. Subjects were randomized to an intervention consisting of dietary potassium restriction or a control group. In addition, the study also assessed whether dietary potassium restriction was associated with any benefits in terms of physical function and quality of life. This was a randomized, single-blind, controlled, phase 2 trial to determine the effects of dietary potassium restriction on neurologic function in CKD. The trial was prospectively registered with the Australian and New Zealand Clinical Trials Registry (12610000538044; 05/07/2010). Assessments were undertaken in the Institute of Neurologic Sciences, Prince of Wales Hospital. Patients were recruited from August 26, 2010 to November 23, 2012, with the last assessment completed in December of 2014 as per funding and timeline restrictions. The study is reported in accordance with the Consolidated Standards for Reporting Trials statement. Eligible subjects were 18–80 years of age and had a diagnosis of stage 3 or 4 CKD according to the Kidney Disease Outcomes Quality Initiative Clinical Practice Guidelines Criteria 2002 criteria (12). Written informed consent was obtained from all participants. Exclusion criteria reflected known contraindications to potassium restriction methods, including pregnancy and use of magnesium-containing laxatives, aluminum- and magnesium-containing antacids, sorbitol, and lithium. The use of medications that inhibit the renin-angiotensin-aldosterone system, such as angiotensin-converting enzyme inhibitors, angiotensin II receptor blockers, or aldosterone antagonists, was permitted in both groups. Patients were excluded if they had current or past history of dialysis therapy or renal transplantation or an eGFR of <15 ml/min. In addition, patients who were unable to provide informed consent or follow dietary protocol due to cognitive impairment or poor comprehension of English were excluded. Patients were allocated to one of two groups: (1) an intervention group that was assigned a dietary potassium restriction protocol with the aim of keeping serum potassium level below 4.5 mEq/L and (2) a control group that was assigned to routine clinical care, which involved clinical intervention only if serum potassium levels were above 6.0 mEq/L. Each subject was enrolled in the intervention or control arm for 24 months. Dietary intakes of potassium, energy, protein, and sodium were calculated for all subjects from a detailed diet history collected by the dietitian at baseline and 6-month intervals throughout the study period. Comprehensive nutrition analyses of the diet histories, including fiber, calcium, iron, phosphorus, vitamin C, and folate, were performed by a computer software package (FoodWorks 2012, Version 7; Xyris Software, Brisbane, Australia). Details of the treatment protocols for each arm of the study were as follows (Table 1). Subjects allocated to this group received regular dietitian consultation, focusing on strategies to reduce potassium intake to 1 mmol/kg ideal body wt. This meant that most patients in the intervention arm were assigned a 60- to 75-mmol/d intake, which is in line with National Kidney Foundation guidelines for potassium restriction in CKD. If the target serum potassium concentration of ≤4.5 mEq/L could not be achieved by dietary intervention alone, as indicated by two consecutive monthly serum potassium values of >4.5 mEq/L, subjects were prescribed sodium polystyrene sulfonate 15 g daily. After institution of sodium polystyrene sulfonate, serum potassium levels were assessed twice weekly for the first week and then weekly until serum potassium concentrations were stable. The sodium polystyrene sulfonate dose was increased to 30 g if serum potassium concentration remained >4.5 mEq/L after 4 weeks of treatment. If the dose was increased to 30 g/d, monitoring was recommenced twice weekly for the first week and then weekly until stable. If serum potassium concentration reduced to <3.5 mEq/L, sodium polystyrene sulfonate was ceased, and monitoring reverted to twice weekly until a stable level was restored. If the potassium level remained below 3.5 mEq/L despite these measures, dietary modifications were relaxed or abandoned. These patients received dietitian review at the same frequency as the intervention group. However, dietary advice was focused on ensuring adequate overall nutrition (13) rather than potassium reduction. Sodium polystyrene sulfonate was only prescribed if serum potassium concentration exceeded 6.0 mEq/L. Neurologic and physical assessments and patient-reported outcomes were undertaken at baseline and 6-month intervals for 24 months. Serum electrolyte levels, parathyroid hormone, eGFR, and urinary potassium excretion were measured at monthly intervals. The primary outcome measure was the change from baseline to final study visit in the total neuropathy score, an outcome measure that has been used in previous studies of neuropathy in diabetes (14) and CKD (9,15,16). This scoring system assesses changes in eight different clinical domains, including symptoms, examination findings, and lower limb nerve conduction values, and assigns a score from zero to four for each domain. The total neuropathy score is generated as the total score of all domains and is between zero and 32 for a single subject. Secondary outcomes included biochemical, functional, neurophysiologic, and quality of life outcomes. Biochemical outcomes were serum concentrations of potassium and parathyroid hormone, eGFR, and urinary potassium excretion. Physical function was assessed using gait speed (meters per second) over 6 m and handgrip dynamometry. Health-related quality of life was assessed using the Short Form-36 health survey and recorded by the attending dietitian to avoid inadvertent unblinding of the assessor undertaking the neurologic and physical assessments. Neurophysiologic studies were conducted using specialized nerve excitability techniques. Nerve excitability assessment is a clinical method that provides information on ion channel function in peripheral nerves (17), which has been used in previous studies of nerve function in CKD (9,10,16). Excitability studies were performed using previously described threshold tracking protocols applied to the median nerve at the wrist (18). Excitability analyses were restricted to two composite scores composed of parameters that are sensitive to changes in membrane potential and have been shown to be abnormal in previous studies of CKD (8,10,16). Specifically, composite score 1 was superexcitability plus depolarizing threshold electrotonus 10–20 ms, and composite score 2 was superexcitability plus hyperpolarizing threshold electrotonus 90–100 ms (17). Adverse events that were attributed to the intervention were recorded by nephrologists and dietitians who were involved in the study. Randomization was stratified according to diabetic status and CKD stage and performed by the National Health and Medical Research Council (NHMRC) Clinical Trials Centre 24-Hour Randomization Service. Randomization was undertaken using a 24-hour interactive voice response system, with permuted blocks of lengths four and six. The sequence was generated by a statistician at the NHMRC Clinical Trials Centre who had no association with the study. All neurologic and physical assessments were conducted by a single investigator who was blinded to treatment allocation. Treatment allocation was known to participants and treating dietitians and nephrologists. Statistical analyses were performed by a biostatistician (A.K.) from the NHMRC Clinical Trials Centre, University of Sydney. Continuous variables were assessed for normality. If normally distributed, variables were summarized with means and SD, and if not, they were summarized with the median and interquartile range. All analyses have n=21 per group unless otherwise stated. Change was calculated as the difference between the last value measured and the baseline value. No imputation was done, and therefore, the change analyzed is the change to the patient’s final visit, which will result in a more conservative comparison between the groups. Comparisons for change used t tests, Wilcoxon tests, or chi-squared tests. The Fisher exact test was used when the proportions were small. When the interventions were compared over all visits adjusted for baseline values, a generalized linear model was used to account for the correlation across time within a patient. For the generalized linear model analyses, if the patient did not have a 24-month value, the final on-study value was used, and the rate of change calculated on the basis of the appropriate number of months on the study. Models for binary outcomes had a log link. Significance was set at a two-sided P value of 0.05. Prespecified subgroups for the primary outcome were analyzed with generalized linear models. Analyses were done with SAS 9.3 (SAS Institute Inc., Cary, NC). The study was originally designed with sample size calculations on the basis of the neuropathy symptom score (19), an ordinal variable (0–3). For a two-sided 5% significance level and 90% power, it was determined that 80 patients (40 in each group) would be required to detect a change from 20% to 70% of patients with a neuropathy score up to one. Before commencement of the trial, the neuropathy symptom score was abandoned, and the total neuropathy score (14) was used in its place. The total neuropathy score has been used extensively in studies of neuropathy related to diabetes (14) and CKD (9,15,16). It has the added advantage of measuring neuropathy severity on a continuous scale and incorporates neuropathic symptoms, clinical signs, and nerve conduction values. Forty-seven patients (30 men and 17 women) were consecutively recruited, five of whom were excluded at the randomization visit. Three of these patients (two in the intervention group and one in the control group) had previously undiagnosed cognitive impairment that was sufficient to impair their ability to comply with the dietary and clinical protocol. The remaining two (both control subjects) were unwilling to comply with the treatment protocol and withdrew before initiation of the trial. The remainder (n=42) were included in the final analysis (Figure 1). The cohort had a mean age of 60±13 years old, a mean eGFR of 35±8 ml/min per 1.73 m2 (stage 3 CKD, n=33; stage 4 CKD, n=14), and a mean body mass index of 34.7±8.3 kg/m2. Type 2 diabetes was present in 50% of the cohort. Randomization was balanced across baseline variables, including diabetic status, eGFR, creatinine, and BP (Table 2). In addition, severity of preexisting neuropathy was equally balanced in control and intervention groups at baseline, with both groups exhibiting >70% prevalence of neuropathy (defined as a total neuropathy score >2) (Table 2). Although qualitative differences were noted in total neuropathy score and sural nerve amplitudes, these were not significant. Causes of CKD were attributed to diabetes (n=14), GN (n=11), polycystic kidney disease (n=5), ischemic nephrosclerosis (n=5), interstitial disease (n=3), nephrectomy (n=2), and unknown causes (n=2). 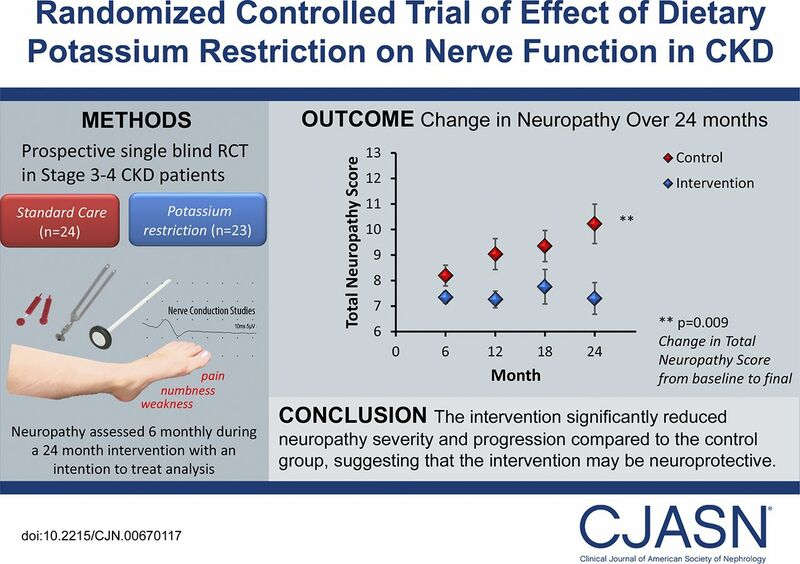 Trial profile of a randomized, controlled trial of the effect of dietary potassium restriction on nerve function in CKD. 47 subjects were randomized and the final analysis consisted of n=21 in each group. Of the 42 participants who received the allocated intervention, n=18 control and n=15 intervention completed the 24-month assessment, and at this time, one participant (intervention group) was receiving dialysis. In the first year, two participants died (n=1 control; n=1 intervention), two were lost to follow-up (n=1 control; n=1 intervention), and two intervention participants declined to continue (leaving n=19 control and n=17 intervention). Between 12 and 24 months, two intervention patients declined to continue; also, one control group patient (on dialysis) had received bilateral lower extremity amputation, and therefore, total neuropathy score could not be obtained and was not included in the 24-month analysis (Figure 1). There was greater reduction in potassium intake and mean serum potassium level in the intervention arm over the duration of the study than in the control arm (Figure 2, Table 3). Specifically, mean serum potassium concentration over the course of the study was significantly lower in the intervention group (4.6±0.5 mEq/L) than in the control group (4.8±0.4 mEq/L; P=0.03) (Table 3). Similarly, mean potassium intake over the course of the study, adjusted for baseline values, was significantly less in the intervention group (3248±204 mg) compared with in the control group (4029±178 mg; P=0.001) (Table 3). There were no significant differences in changes in other dietary variables, including sodium, protein, and energy intake, or dietitian subjective global assessment. Change from baseline to final 24-hour urinary potassium output was not significantly different between groups. Additionally, there was no significant relationship between urinary potassium and self-reported potassium intake. 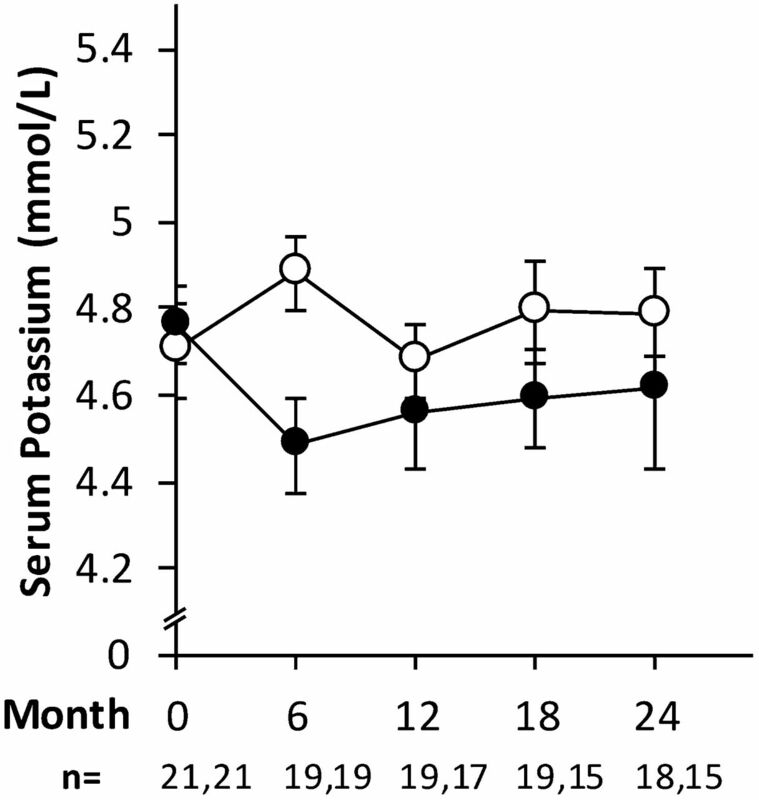 In a randomized, controlled trial of dietary potassium restriction over 2 years, there was a marked reduction in serum potassium in the intervention arm (black circles) that continued for the duration of the study. Data are expressed as mean serum potassium (±SEM) for intervention (black circles) and control (white circles). The numbers analyzed at each time point are stated below the x axis as control and intervention, respectively. There was a significant difference in the mean change in total neuropathy score between the two groups over the course of the study. Specifically, neuropathy severity increased by 2.8±3.3 points in the control arm compared with 0.4±2.2 points the intervention arm (P<0.01) (Figure 3, Table 4). This difference in change of the total neuropathy score equates to a Cohen d of 86%, which indicates a large effect size (20). Results from the generalized linear model analyses showed that there was also a significant difference in the rate of increase in total neuropathy score over the course of the study, with a reduced rate of increase in total neuropathy score noted in the intervention arm (0.0±0.2 points per 6 months) compared with the control arm (0.6±0.2 points per 6 months; P=0.03). Although sustained progression of neuropathy was noted in the control arm (Figure 3), there was no significant change in total neuropathy score in the intervention group compared with baseline values (P=0.44). A sensitivity analysis of patients with preexisting neuropathy (total neuropathy score ≥2) at baseline showed a similar difference in mean change in total neuropathy score between the groups as for the whole cohort (3.6±3.4–0.5±2.6; P<0.01). In a randomized, controlled trial of dietary potassium restriction over 2 years, the intervention group showed stable neuropathy scores (black diamonds), whereas the control group showed a progressive increase in neuropathy severity (white diamonds). These changes occurred in the presence of a progressive decline in eGFR that was comparable between groups (control, white circles; intervention, black circles). Neuropathy values are mean total neuropathy scores (±SEM) adjusted for the baseline value. The circles are unadjusted mean eGFR values (±SEM) obtained at 6-month intervals. The numbers analyzed at each time point are stated below the x axis as control and intervention, respectively. Physical function was assessed using the 6-m walk test as a measure of gait speed. Although there were no baseline differences in this measure between the two groups, there was an improvement in the intervention arm (0.15±0.17 m/s) compared with the control arm (0.02±0.16 m/s) over 24 months (P=0.01) (Table 4). Nerve excitability studies were undertaken in all patients. A composite excitability score composed of superexcitability and hyperpolarizing threshold electrotonus, sensitive markers of nerve membrane potential (17), showed significantly greater abnormalities in the control arm compared with those in the intervention arm (2.3±2.2 to −5.1±2.8; P=0.04) (Table 4). The pattern and direction of change in nerve function noted in the control arm were consistent with previous studies of patients with CKD exposed to high serum potassium concentrations (8,10,16). There was no significant change in the other composite score composed of superexcitability with depolarizing threshold electrotonus. There was no significant difference in the change in health-related quality of life in the domains of general health, bodily pain, and physical or social functioning. A higher proportion of patients in the control group had an improvement in score for mental health and limitations due to emotional problems (29% and 62%, respectively) compared with those in the intervention group (5% and 24%, respectively). There was no significant difference in changes in individual nerve conduction parameters between the two groups. There were no serious adverse events relating to the intervention. There were two incidences of asymptomatic hypokalemia in the intervention arm, both of which occurred in the context of sodium polystyrene sulfonate use. 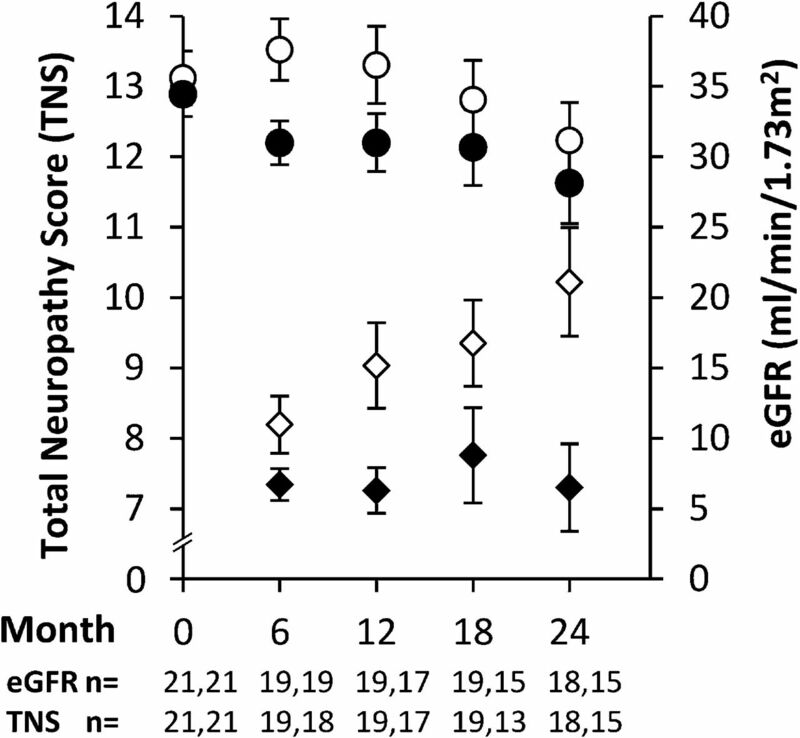 This study investigated the potential role of dietary potassium control on neuropathy in a cohort of patients with moderate severity CKD who were monitored over 24 months. The major finding was that the intervention significantly reduced neuropathy progression compared with the control group, suggesting that the intervention may be neuroprotective (Figure 3). Another major finding of this study was an improved gait speed noted in the intervention arm over the course of the study. Importantly, there were no significant differences in baseline variables between the groups, and the effect was maintained when analyzing only those with preexisting neuropathy. The beneficial effects occurred despite the unrestricted use of renin-angiotensin-aldosterone system inhibitors (Table 2), which typically increase serum potassium concentration. Although results of this study suggest that the intervention may have long-term benefits in terms of neuromuscular outcomes, there are several limitations of this study. The small sample size represents one such limitation. This study was insufficiently powered to statistically examine the effect of diabetic status on outcomes. As such, a dedicated study in a diabetic CKD cohort is required to more rigorously assess whether there are differences in response between patients with CKD who are diabetic and patients with CKD who are not diabetic. We did not examine total body potassium, which can be unrelated to serum potassium levels and is influenced by a multitude of factors in CKD (21). Although there were no safety concerns related to the treatment in this study, assessment of total body potassium using radiolabeled potassium followed by whole-body scanning (22) may be beneficial in future studies to ensure that there are no adverse effects from the intervention. There were qualitative differences for sural nerve amplitude and total neuropathy score at baseline that could be more robustly controlled with a larger sample size. Given that the intervention was largely dietary and that the patients were not blinded to treatment allocation, it is possible that this may be a source of bias, because the total neuropathy score does include patient symptoms as a small component of the overall score. However, it is important to note that the majority of the total neuropathy score is derived from clinical evaluation and nerve conduction studies, which are objective markers of neuropathy, and the investigator undertaking these studies was blinded to treatment allocation. Potassium is one modifiable factor among many potential contributors to neuromuscular deficits in CKD. Despite these limitations, this study was a critical preliminary step that will form the basis of future studies in larger, multicenter cohorts. In approximately 53% of subjects in the intervention arm, the prescribed diet was sufficient to meet the monthly target potassium without any need for supplemental sodium polystyrene sulfonate at any stage of the study. In the remainder, sodium polystyrene sulfonate was required for varying periods of time to achieve the target. Moreover, analysis of dietary variables showed that the intervention specifically targeted potassium with no differences in protein, sodium, or energy intake or any other nutritional parameter, suggesting that the intervention is safe. It is important to note that this dietary intervention was delivered by qualified dietitians to avoid inadvertent deficiencies in other nutritional variables or overall nutritional status. To date, there are few randomized clinical trials investigating dietary potassium restriction in CKD (23), and thus, additional high-quality controlled studies are required to systematically investigate safety, nutritional, and disease outcomes. This study was a proof of concept study on the basis of a wealth of recent work, which has provided evidence that high levels of serum potassium mediate nerve dysfunction in CKD by altering nerve (8,10,11,24) and muscle (25) ion channel function. These studies showed correlations between neurophysiologic parameters and serum potassium concentration and suggested that peripheral nerve and skeletal muscle dysfunction may occur, even at serum potassium concentrations in the high normal range (8,11,24). A more recent study incorporated a dialysis intervention, in which serum potassium levels were clamped at high levels for the first 3 hours of a modified dialysis session while allowing all other solutes to be removed. Nerve function remained abnormal for the 3-hour clamp period, despite the significant clearance of other uremic toxins, which suggested a possible causal role for hyperkalemia in the development of nerve dysfunction (10). It is widely accepted that neurologic complications in CKD worsen with increasing renal impairment (26,27), although the expected rate of progression remains unclear. The data obtained from our control cohort represent the first longitudinal investigation of natural progression of neuropathy in stages 3 and 4 CKD. This group had an increase in neuropathy severity that was evident even at the 6-month assessment and continued progressively over 2 years. This was more rapid than changes expected with diabetic neuropathy alone, which have been shown to occur over a slower time course of 5–10 years (28). Importantly, dietary potassium restriction in moderate severity CKD provides a potential method of preventing the progression of neurologic disability. In terms of physical function, the study showed improved gait speed in the intervention group, and this parameter is an important marker of overall health and mortality in CKD. Studies of gait speed have shown associations with health outcomes in patients with stages 2–4 CKD (5) and those receiving hemodialysis (4). In a study of 385 patients with stages 2–4 CKD, reduced gait speed was associated with a 26% higher risk of death at the 3-year follow-up (5). A previous study in community-dwelling older adults showed that survival increased significantly at increments of 0.1 m/s (29). Additionally, a gait speed of <1.0 m/s has indicated increased risk for adverse events in patients on dialysis (30). Taken together, these studies show that the improvement of 0.15 m/s noted in the intervention group may be of clinical importance. This study provides strong preliminary evidence that dietary potassium restriction may be neuroprotective in CKD. It reduces neuropathy severity, slows the progression of preexisting neuropathy, and improves physical function. The study raises the possibility that modifications to current dietary guidelines in stages 3 and 4 CKD with greater emphasis on potassium control may potentially reduce neurologic and physical disability in this patient group. The study was supported by National Health and Medical Research Council grant 630425. RA was supported by an Early Career Fellowship through National Health and Medical Research Council of Australia grant 1091006. AVK was supported by a Career Development Fellowship from the National Health and Medical Research Council of Australia (1065663). See related editorial, “Approaches to and Clinical Benefits of Reducing Dietary K in CKD,” on pages 1559–1560.